Ancient Ebla was located in Northern Syria, approximately halfway between the modern cities of Hamath and Aleppo. Excavations at that site began in the 1960s, and in the 1970s a series of extraordinary tablets was discovered among the ruins of an ancient palace. These tablets became known as “The Ebla Tablets”, and they were originally discovered under the direction of two professors from the University of Rome – Dr. Paolo Matthiae and Dr. Giovanni Petinato. At this point, about 17,000 tablets from the ancient Eblaite Kingdom have been recovered. These tablets appear to have been written during the two last generations of ancient Ebla. This means that they probably come from some time around 2300 to 2250 B.C. But what is remarkable about the Ebla tablets is not how old they are, but rather the amazing parallels to the Bible that they contain. For example, one scholar was very surprised at just how close much of the language on the tablets is to ancient Hebrew…. The vocabularies at Ebla were distinctively Semitic: the word “to write” is k-t-b (as in Hebrew), while that for “king” is “malikum,” and that for “man” is “adamu.” The closeness to Hebrew is surprising. In addition, a vast array of Biblical names that have not been found in any other ancient Near Eastern languages have been reported to have been found in similar forms in Eblaite (one of the two languages found on the tablets). For instance, the names of Adam, Eve, Abarama/Abraham, Bilhah, Ishmael, Esau, Mika-el, Saul and David have been found on the tablets. Now, it is important to note that the tablets are not necessarily referring to those specific people. Rather, what it does demonstrate is that those names were commonly used in ancient times. In addition, quite a few ancient Biblical cities are also mentioned by name in the Ebla tablets. For example, Ashtaroth, Sinai, Jerusalem, Hazor, Lachish, Megiddo, Gaza, Joppa, Ur, and Damascus are all reportedly referred to by name in the tablets. Giovanni Pettinato says that he also found references to the ancient cities of Sodom and Gomorrah in the tablets. In fact, one key discovery appears to relate directly to Genesis chapter 14. Some Bible skeptics have long tried to claim that the victory of Abraham over Chedorlaomer and the Mesopotamian kings in Genesis 14 was fictional and that the five “cities of the plain” (Sodom, Gomorrah, Admah, Zeboiim and Zoar) referred to in that chapter are legendary. 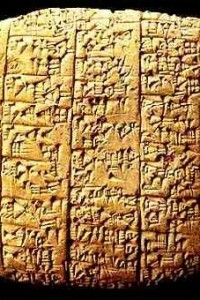 But it turns out that the Ebla tablets refer to all five of the “cities of the plain”, and on one tablet the cities are listed in the exact same order that we find in Genesis chapter 14. Even more extraordinary was the discovery of “a creation hymn” in the tablets. In fact, three different versions of the Eblaite “creation hymn” were discovered. One of the creation hymns was translated by Pettinato as follows…. This clearly parallels the Biblical account. In the Bible we also find a “Lord of heaven and earth” who created the earth and everything around it out of nothing. However, it is important to note that Ebla was primarily a pagan culture. Pagan gods such as Dagan, Baal and Ishtar were very important to the people of that time. But the truth is that these tablets do confirm quite a few historical details found in the Scriptures. There is probably much more to be discovered about the ancient Eblaite people, but in recent decades progress has been slowed by religious and political conflicts. Perhaps we will never know for certain where the people of ancient Ebla came from, how much they actually knew of the true God of the Bible, or why their language had such similarities to Hebrew.